Carmine's Steak House is located in the beautiful Drury Plaza Hotel on the corner of Fourth and Walnut, just a few blocks from Busch Stadium. 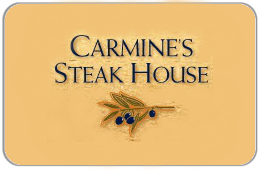 Carmine's menu includes a variety of aged beef and handcut chops, fresh seafood, chicken entrees and delicious housemade desserts. If it's a private room you need, Carmine's can accommodate up to 125 people for lunch or dinner banquets. Seven nights a week, come see why the critics are raving. Carmine's also offers complimentary valet parking on Walnut Ave. Gift Cards accepted at all five Lombardo's Family Restaurants! For balance inquiries call the phone number to a Carmine's Steak House's location below.